At the Websters Theatre, Great Western Road, Glasgow. From Thursday 3rd December 2015 to Sunday 3rd January 2016 a pantotastic professional cast take to the Websters Theatre in the all-singing, all-dancing first class family pantomime, A BELTER OF A CINDERELLA STORY. The Scottish theatre company is thrilled to be bringing another amazing pantomime back to the new West End theatre. The show is penned by Insideout's artistic director, Paul Harper-Swan, who is 'over the moon with the phenomenal cast'. Miller will be joined this year by a host of Scottish actors: Joanne McGuinness (Glasgow Girls) as Cinderella, Alison Rona Cleland (I Will Survive) as Whitney the Ugly Sister, Jamie McKillop (The Pure Amazing Wizard of Oz) as the Fabulous Fairy G Mother and Dario Cacioppo (Back to Broadway). 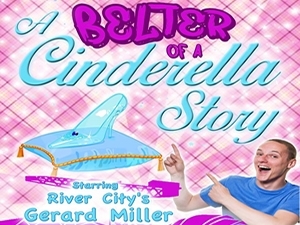 This is a panto Glasgow shouldn't miss! Oh no it’s not!